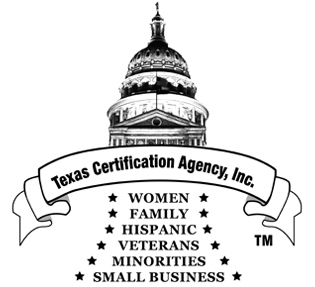 Texas Certification Agency, Inc. (Texas Certification Directory™) provides voluntary certification to businesses qualifying for its Small Business Certification program ("Small Business Certification"), according to the qualifications adopted by Texas Certification Directory™ and set forth in these Terms and Conditions ("Agreement" or "Contract"). As an applicant for Small Business Certification, you, the applicant, on behalf of yourself as well as your company, heirs, agents, successors, and assigns, ("participant(s)") acknowledge that you have read, understand, and agree to be bound by all terms and conditions set forth in this Agreement and included by reference. By submitting an application for Small Business Certification to Texas Certification Directory™, you authorize the disclosure of the required documentation listed herein and agree to abide by all terms and conditions of this Agreement, as well as any agreements that Texas Certification Directory™ is currently bound by or will be bound by in the future. You acknowledge that this Agreement is legally binding under the laws of the United States of America and upon submission you have entered into a legally enforceable Contract ("click through contract") with Texas Certification Directory™, as though a physical signature was provided. If you do not agree to the terms and conditions of this Agreement, you are expressly prohibited from applying for or accepting Small Business Certification through Texas Certification Directory™. Texas Certification Directory™ may, from time to time, within our sole and absolute discretion, modify, limit, change, discontinue, or replace this Agreement or any portion thereof. It is your responsibility to review this agreement WHERE PUBLISHED ON www.texascertificationagency.com on a regular basis to keep yourself informed of any modifications. In the event we modify, limit, change, or replace all or any portion of this Agreement, NOTIFICATION is DEEMED made immediately upon publication of THE MODIFICATION, LIMITATION, CHANGE, OR REPlACEMENT ON THE Texas Certification Directory™ website (www.texascertificationagency.com), and your continued use and/or promotion of your voluntary participation in Texas Certification Directory's™ Small Business Certification program thereafter, constitute your manifestation of assent to the modification, limitation, change, or replacement. This Agreement is effective as of the date your application is submitted to Texas Certification Directory™ or your payment is processed. The term of this Contract is one (1) year (365 days) from the date of the electronic submission of this Agreement (Contract) or the date that the annual certification fees are successfully processed. Electronically submitting this Agreement constitutes your willingness to enter into this Contract, and representation and warranty by You that You are at least eighteen (18) years of age; have the right, power, legal capacity and appropriate authority to contract on behalf of the company; and are an authorized agent of the company and the owner(s) listed on company documents. Texas Certification Directory™ has not, is not, and will not make any guarantees, promises, or warranties that your company will gain financial benefit or obtain participatory access in any diversity or procurement program as a result of your voluntary participation in the Texas Certification Directory™ Small Business Certification program. Texas Certification Directory™ is not owned or affiliated with, and does not sponsor or endorse any particular company applying for voluntary participation in the Texas Certification Directory™ Small Business Certification program. Small Business Certification of a business by Texas Certification Directory™ is based exclusively on the company's qualifications for Small Business Certification and its conduct, as outlined in this application. Texas Certification Directory™ makes no representations regarding the quality, safety, morality, or legality of any aspect of the applicant company's business, products, or services. 2. APPLICATION AND APPROPRIATE USES. The electronic submission of this Agreement is Your application to voluntarily participate in Texas Certification Directory's™ Small Business Certification program. Texas Certification Directory™ does not guarantee or promise approval of your Small Business Certification application and may deny admission to applicants who fail to meet the certification requirements, complete the application, or fulfill the responsibilities as outlined by this Agreement. You acknowledge that you submit this application at your own risk and that, in the event that you are not admitted to the Small Business Certification program, you remain legally bound by the terms and conditions of this Agreement with Texas Certification Directory™. (6) If registered with the Texas Secretary of State Corporation Section, a status of "ACTIVE" or "IN TEMPORARY GOOD STANDING" from the Texas Comptroller. All information provided throughout the application process must be consistent. Failure to provide consistent information throughout the application process will result in the denial of your application. (5) a change in the email address of the "point-of-contact" on file with Texas Certification Directory™. If, for whatever reason, You fail to notify Texas Certification Directory™ within five (5) business days of any material change, as defined above, such failure will constitute a material breach of this Contract and Texas Certification Directory™, upon learning of the material change, will suspend your Small Business Certification participation in accordance with the Texas Certification Directory™ due process policies. You agree that Texas Certification Directory™ may use and rely on any information provided by You for all purposes related to Your voluntary participation in the Texas Certification Directory™ Small Business Certification program. If You provide any information that is inaccurate, not current, false, misleading, or incomplete; or if Texas Certification Directory™ has reasonable grounds to suspect that Your information is inaccurate, not current, false, misleading, or incomplete; Texas Certification Directory™ has the absolute right, in accordance with its due process policies, to terminate your voluntary participation in the Texas Certification Directory™ Small Business Certification program. Additionally, you hereby acknowledge and agree that you are prohibited from assigning your rights and obligations under this Agreement. We may assign our rights and obligations under this Agreement at any time, including but not limited to in a sale of or other transaction involving the Small Business Certification program. Texas Certification Directory™ reserves the right, in accordance with its due process policies, to terminate your voluntary participation in the Texas Certification Directory™ Small Business Certification program if your participation results in, or is the subject of, legal action or threatened legal action, against Texas Certification Directory™ or any of its affiliates or partners, and to terminate without consideration for whether the legal action or threatened legal action is ultimately determined to be with or without merit. (1) Submit a professionally written Appeal letter by the company's point-of-contact or owner(s), as recognized by Texas Certification Directory™, sent via email to info@texascertificationdirectory.org or fax to (512) 852-4629 explaining the material change. (2) Submit newly completed, up-to-date, required supporting documentation sent via email to info@texascertificationdirectory.org or via fax to (512) 852-4629. (3) Complete a new online application for voluntary participation in Texas Certification Directory™ Small Business Certification program (at no additional cost), available at www.texascertificationdirectory.org. Failure to complete the due process procedures for material changes within fourteen (14) days of the email notification sent by Texas Certification Directory™ advising of the discovery of the material change will result in termination of your Small Business Certification, effective on the 15th day after the Texas Certification Directory™ email notification. Such breaches of Contract causing termination of your voluntary participation in the Texas Certification Directory™ Small Business Certification program constitutes a forfeiture of your voluntary participation in the Small Business Certification program and affords you no right to refund or credit for lost fees. To qualify for participation in the Texas Certification Directory™ Small Business Certification program, the company ("Applicant") cannot exceed the expressed maximum number of employees allowed or maximum annual receipts in millions of dollars allowed for the company and its affiliates identified by North American Industry Classification System (NAICS) codes as disclosed at the website http://www.texascertificationdirectory.org/small-business-size-standards.htm. Additionally, company ("Applicant") must be registered in the state of Texas. 1. One (1) copy of government issued identification. A valid, current, and legible copy of your United States of America or Foreign-Government issued Passport, or United States of America Department of State issued Visa, Driver's License, or State Identification issued from a state located within the United States of America for the person named as a company officer or director on this electronic submission and completing the sworn affidavit. * Assumed Name / Doing-Business-As filing from a Texas County Clerk may be obtained from the Texas County Clerk for which the registration was filed. * Certificate of Status / Certificate of Existence may be obtained from the Texas Secretary of State via telephone request at (512) 463-5578. 3. One (1) copy of the Texas Certification Directory™ signed and notarized Small Business Certification sworn affidavit executed by the person named as a company officer or director on this electronic submission. 4. One (1) copy of the Texas Certification Directory™ Authorization Letter. All companies registered with the Texas Secretary of State Corporation Section applying for voluntary participation in the Texas Certification Directory™ Small Business Certification program are required to possess a Texas Comptroller status showing "Active" or "Active, Eligible for Termination/Withdrawal". Online applications / electronic submissions are required to submit all required documentation as stated in Section "3. REQUIRED SUPPORTING DOCUMENTATION." The Agreement registration fee must be concurrently paid along with the submission of this Agreement. Failure to submit payment within fourteen (14) days of submitting this Agreement will result in the forfeiture of your Application for voluntary participation in the Texas Certification Directory™ Small Business Certification program with no right to refund or credit for the fees paid to process this electronically submitted Application. The Authorization Letter will be sent via email to the point of contact indicated in this Agreement/Application upon receipt by Texas Certification Directory™ of at least two of the required supporting documentation, this Agreement, and registration fee payment. The Authorization Letter is a required step in the application process and will not be sent unless and until this Agreement, the registration fee, and at least two of the required supporting documents are received. Texas Certification Directory™ must receive all of the required supporting documentation, as outlined below, within fourteen (14) days from the date that this electronic submission is executed and the registration fee is paid; or from the date on which the renewal payment was processed by Texas Certification Agency, Inc. Documents are deemed received upon receipt via facsimile at (512) 852-4629 or email at info@texascertificationdirectory.org. Failure to submit all of the required supporting documentation within the fourteen (14) day timeframe will constitute forfeiture of this Application for voluntary participation in the Texas Certification Directory™ Small Business Certification program with no right to refund or credit for the fees paid to process this electronically submitted Application. Items not received by Texas Certification Directory™ or missing from your submission will only be disclosed to the applicant if Texas Certification Directory™ receives at least two of the required supporting documents as outlined in the Section "3. Required Supporting Documentation" (at least two of Items 1-4). You must submit all required supporting documentation for Your annual renewal to voluntarily participate in the Texas Certification Directory™ Small Business Certification program. All required supporting documentation must be received within fourteen (14) days of renewal payment processing by Texas Certification Directory™. All required documents must be submitted to Texas Certification Directory™ via email at info@texascertificationdirectory.org or fax at (512) 852-4629. Successful processing by Texas Certification Directory™ of your payment constitutes acknowledgement of your application to voluntarily participate in the Texas Certification Directory™ Business Certification program. The successful processing of payment by Texas Certification Agency, Inc. will serve as entrance into Contract between You and Texas Certification Directory™, and the appearance of credit / debit card charges on Your credit card / debit card statement will serve as Your receipt for the transaction. Payment should be accompanied by the submission of this Agreement to facilitate the initial stages of processing your Application for voluntary participation in the Texas Certification Directory™ Small Business Certification program. In consideration for processing Your application for voluntary participation in the Texas Certification Directory™ Small Business Certification program, You agree that all fees paid to and processed by Texas Certification Agency, Inc. are immediately the property of Texas Certification Agency, Inc., and are non-refundable, even if You fail to complete the application process or are denied Certification by the Texas Certification Directory™ Small Business Certification program. Applications that fail successful payment processing twice (two (2) times) will be denied future opportunities to electronically apply for voluntary participation in the Texas Certification Directory™ Small Business Certification program, unless at least one member of the company Board of Directors provides a written letter. The individual's (or individuals') membership(s) on the Board of Directors must be evidenced by declaration with the Texas Secretary of State or by appearance of individual's (or individuals') name(s) on the certificate of registration with the Texas County Clerk, as applicable. The written letter should be sent via fax to (512) 852-4629 or email to info@texascertificationdirectory.org accompanied by the following supporting documentation: (1) a copy of the assumed name certificate (if registered with a Texas County Clerk); or (2) Certificate of Formation (if registered with the Texas Secretary of State), as applicable; and (3) the Texas Certification Directory™ Habitual Payment Failure Letter. Applicants that claim the electronic application and payment for voluntary participation in the Texas Certification Directory™ Small Business Certification program were unauthorized are not eligible for any refund or return of fees paid and processed by Texas Certification Directory™. It is the responsibility of all debit and credit cardholders to safe-guard their information and therefore it is not the responsibility of Texas Certification Directory™ nor the liability of Texas Certification Directory™ for an individual or company's negligence as a debit and credit cardholder. This Agreement is automatically renewed on the 365th day. Cancellation must be requested and sent via email to info@texascertificationdirectory.org no less than 30 days prior to the date of renewal to be recognized as valid. Confirmation by Texas Certification Directory™ of the cancellation request will be sent to the company's point-of-contact via email and serves as the only and official aknowledgment of renewal payment cancellation. Renewal payments for voluntary participation in the Texas Certification Directory™ Small Business Certification program are automatically processed no earlier than 364 days from the date of the previous successful payment using the credit card / debit card information provided in the previous electronic submission/Application for voluntary participation in Texas Certification Directory™ Small Business Certification program. If the participant fails to timely cancel this Agreement, evidenced by email confirmation from Texas Certification Directory™, prior to the renewal date (no less than 30 days), the participant remains obligated to Texas Certification Directory™ for the total amount of the renewal fee. Failure to pay or timely request cancellation will result in the initiation of legal action by Texas Certification Directory™ against participant for collection of the owed renewal fees. Participant has fourteen (14) days to honor payment by completing a new online application with valid credit / debit card data and the required supporting documentation. Failure to resolve the owed renewal fee payment within 14 days after email notification is sent by Texas Certification Directory™ informing the participant company's point of contact that payment was not received, will entitle Texas Certification Directory™ to commence collection and / or other legal recourse procedures as outlined in the Dispute Resolution Section of this Agreement on the 15th day after initial renewal fee payment failure. If for any reason Texas Certification Directory™ is unable to successfully process payment for the renewal fee, Texas Certification Directory™ reserves the right to require that You complete a new online application and provide a new and valid payment method in lieu of the automatic annual renewal. The unsuccessful processing of renewal fee payment does not terminate this Contract or your obligation to honor the renewal fee, and will constitute a breach of contract. Such breach of contract entitles Texas Certification Directory™ to pursue legal recourse as outlined in Dispute Resolution section of this Agreement to recover the owed renewal fee. "Chargebacks" constitute a breach of this Contract. Any chargeback filed is a direct breach of this Contract and does not nullify the monies owed to Texas Certification Agency, Inc. You agree that Texas Certification Agency, Inc., may immediately take legal action against You in response to a chargeback filed by you or in connection with this Agreement to recover the fees paid to Texas Certification Directory™, as well as reasonable legal fees, filing fees, and other associated costs Texas Certification Agency, Inc., accumulates attempting to recover these fees via legally-binding arbitration administered by American Arbitration Association, in accordance with the Dispute Resolution clause herein. You agree and understand that you will be liable for up to three (three (3)) times the application fee in damages as well as reasonable legal fees, filing fees, and other associated costs Texas Certification Agency, Inc., accumulates attempting to recover these fees via legally-binding arbitration administered by American Arbitration Association, in accordance with the Dispute Resolution clause herein. You agree and understand that Texas Certification Directory™ reserves the right to respond to your chargeback filing in addition to or in lieu of initiating Arbitration in accordance with the Dispute Resolution section of this Agreement and does not waive its right to initiate Arbitration at any time. 5. FORFEITURES, DENIALS, & REAPPLICATION REQUIREMENTS. Every applicant for voluntary-participation in the Texas Certification Directory™ Small Business Certification program may submit their required supporting documentation up to two (2) times for review. Texas Certification Directory™ must receive the first submission of required supporting documentation via fax (at (512) 852-4629) or email (at info@texascertificationdirectory.org) within fourteen (14) days of electronically submitting this Application, as evidenced by Texas Certification Directory™ receipt. Upon receipt of Your first submission, Texas Certification Directory™ will notify You via email, of any errors, omissions and / or deficiencies in your application to allow You to correct the errors, omissions, and / or deficiencies ("Deficiencies Notification Email"). After notification through the Deficiencies Notification Email, You may submit the required supporting documentation for a second and final review and / or complete a new online application (i.e. electronic submission), at no additional cost, for final review within fourteen (14) days of the date the Texas Certification Directory™ sent the Deficiencies Notification Email. Failure to submit the required supporting documentation for a second and final review and / or complete a new online application (i.e. electronic submission), at no additional cost, for final review within fourteen (14) days after Texas Certification Directory™ sent the Deficiencies Notification Email will result in the forfeiture of Your application to voluntarily participate in the Small Business Certification program offered by Texas Certification Directory™ with no right to refund or credit for the fees paid to Texas Certification Directory™. (3) applicant failed to appeal the denial of its application for voluntary participation in the Texas Certification Directory™ Small Business Certification program within fourteen (14) days of the date of denial. (4) applicant's Authorization Letter was not received within fourteen (14) days after the date Texas Certification Directory™ email the Authorization Letter to the participant's point-of-contact. Forfeited applications result in the immediate termination of the application process, the non-refundable forfeiture of all fees paid in connection with the application, and the refusal of all additional documentation submissions in connection with that applicant. Forfeited applications are not subject to the annual renewal fee nor are they required to send written notification 30-days before the annual renewal date cancelling participation in the Texas Certification Directory™. (2) Re-Submit all of the required supporting documentation for each program in which you seek to participate. (3) Provide an Appeal Letter, professionally written by the point-of-contact identified in the first application to Texas Certification Directory™. (4) Submit via email to info@texascertificationdirectory.org or fax to (512) 852-4629. Applications appealed and subsequently denied by Texas Certification Directory™ are immediately terminated, with no right to refund or credit. Failure to submit supporting documentation within the fourteen (14) day time period will result in forfeiture of Your right to appeal the decision and thereby terminates Your application for voluntary participation in the Texas Certification Directory™ Small Business Certification program. The enrollment or effective date of Your voluntarily-participation in the Texas Certification Directory™ Small Business Certification program will be the date on which Texas Certification Directory™ completes the processing of Your application for voluntary participation in the Texas Certification Directory™ Small Business Certification program, including the processing of your payment. The Texas Certification Directory™ Small Business Certification expires 365 calendar days from the date this electronic Application is submitted and payment is processed. During a leap year, the expiration date will not exceed 366 calendar days from the date of this electronic submission. You agree that Texas Certification Directory™ may audit your company at any time within the term of this Contract by requiring the company officer or director listed in this electronic submission to execute a new Texas Certification Directory™ Small Business Certification sworn affidavit. You will be advised of an audit via an "Audit Notification Email" from Texas Certification Directory™. The newly executed sworn affidavit must be submitted to the Texas Certification Directory™ via fax at (512) 852 - 4629 or email atinfo@texascertificationdirectory.org, within fourteen (14) days of the date the Audit Notification Email was sent. Texas Certification Directory™ audit procedures adhere to the same certification application procedures as outlined in Section "3. REQUIRED SUPPORTING DOCUMENTATION." Failure to comply with the Texas Certification Directory™ audit or failure to satisfy the certification application procedures as outlined in Section "3. REQUIRED SUPPORTING DOCUMENTATION" will constitute a breach of this Contract and will be addressed in accordance with the due process policies of Texas Certification Directory™, as set forth herein. (2) Re-Submit all of the required supporting documentation for each program in which you seek to participate, via email to info@texascertificationdirectory.org or via fax to (512) 852-4629. Failure to complete the due process procedures of the audit within fourteen (14) days of the date Texas Certification Directory™ sent the Audit Email Notification will constitute a breach of Contract and will result in the termination of Your voluntary-participation in the Texas Certification Directory™ Small Business Certification program. Termination will be effective on the 15th day after the date the Audit Email Notification was sent by Texas Certification Directory™. Such breaches of Contract causing termination of your voluntary participation in the Texas Certification Directory™ Small Business Certification program constitutes a forfeiture of your voluntary participation in the Small Business Certification program, and affords you no right to refund or credit for lost fees. 7. PROFESSIONAL CODE OF CONDUCT AND ETHICS. Libelous Statements in Print or Electronic Media. You agree that violations of the Professional Code of Conduct constitute a breach of this Contract and will be addressed in accordance with the audit, due process, professional code of conduct policies, and / or slander / libel due process policies of Texas Certification Directory™ as set forth herein. You agree to conduct Your business activities in an ethical manner and in accordance with the criminal laws of the State of Texas and United States of America. In the event You or Your company are convicted of a crime related to the promotion of Your voluntary participation in the Texas Certification Directory™ Small Business Certification program, the conviction will constitute a breach of Contract and will be addressed in accordance with the due process policies of Texas Certification Directory™ as set forth herein. Failure to notify Texas Certification Directory™ within five (5) days of a criminal conviction that was directly or indirectly related to Your promotion of Your voluntary participation in the Texas Certification Directory™ Small Business Certification program will result in the suspension of Your company's Small Business Certification, effective on the 6th day after the date of criminal conviction. This suspension will remain in effect until the 365th day after the date of You electronically submitted this application for voluntarily participation in the Texas Certification Directory™ Business Certification program. On the 365th day, Your voluntary participation in the Small Business Certification program will be terminated. Any suspended status may be relieved based upon the filing of an appeal of the conviction in a court of jurisdiction, if Texas Certification Directory™ is notified via email (sent to info@texascertificationdirectory.org) within five (5) days of the date the appeal was filed. Any slanderous or libelous communications made by You shall constitute a breach of this Contract and may involve civil actions by Texas Certification Directory™ or any of its affiliates or partners against You and Your company. In the event Texas Certification Directory™ or any of its affiliates or partners learns of any slanderous or libelous communications made by you, an email entitled "Cease and Desist" will be sent from Texas Certification Directory™ to the company point-of-contact recognized by Texas Certification Directory™. Failure to immediately adhere to the cease-and-desist email will result in the suspension of You and Your company from voluntary participation in the Texas Certification Directory™ Small Business Certification program as civil legal remedies are pursued. Subsequently, on the 365th day after the date this Application was electronically submitted, Your voluntary participation in the Texas Certification Directory™ Small Business Certification program will be terminated. You agree that Texas Certification Directory™ holds all rights, title, and interest in all Texas Certification Directory™ publicity and intellectual property, including other rights related to intangible property, unless otherwise indicated. You agree that Texas Certification Directory™ materials are the intellectual property of Texas Certification Directory™ and your use, assignment, and / or possession of Texas Certification Directory™ materials may be terminated in accordance with the Texas Certification Directory™ due process policies, as set forth herein. You agree that the Texas Certification Directory Number™ assigned to you upon Certification is the intellectual property of Texas Certification Agency, Inc. You agree that the listing of Your voluntary participation in the Texas Certification Directory™ Small Business Certification program will be displayed on the Texas Certification Directory™ website, www.texascertificationdirectory.org, and that Texas Certification Agency, Inc., is the issuing agency and sole party responsible for the content maintained on the Texas Certification Directory™ website as it relates to You and Your company's voluntary participation in the Texas Certification Directory™ Small Business Certification program. Upon termination of Your voluntary participation in the Texas Certification Directory™ Small Business Certification program, You are required to cease-and-desist all promotion of Your voluntary participation in Texas Certification Directory™ Small Business Certification program except in a factually accurate reference to your past and current status with Texas Certification Directory™, or in reference to the Texas Certification Directory™ website, www.texascertificationdirectory.org. Your voluntary participation in the Texas Certification Directory™ Small Business Certification program will be publicly disclosed on the Texas Certification Directory™ website, www.texascertificationdirectory.org. Information disclosed will include (1) the enrollment date; (2) expiration date; (3) company full legal name; (4) company assumed name or trademark name; (5) Texas jurisdiction of registration; (6) company officer or director listed in this electronic submission; (7) assigned Texas Certification Directory Number™; and (8) current status as participant in the Small Business Certification program. You agree to abide by the due process policies of Texas Certification Directory™ and acknowledge that the status listed in the Texas Certification Directory™, www.texascertificationdirectory.org will state "NOT IN GOOD STANDING" as of the date such status was issued in accordance with the due process policies of Texas Certification Directory™, or as of the date your current Contract for voluntary participation in the Small Business Certification program expires. You agree and consent that telephone conversations through wireline, landline, cellular, and / or electronic communication media may be recorded by Texas Certification Directory™ for "quality control" measures without prior verbal notification or the presence of a "beep tone." Recognized forms of communication between you and Texas Certification Directory™ are to be (1) email communication sent to info@texascertificationdirectory.org or other authorized email address of Texas Certification Directory™; (2) telephone communication using the phone number of (512) 201 - 2827; and / or (3) fax communication using the fax number of (512) 852 - 4629. The preferred communication method with Texas Certification Directory™ is email to info@texascertificationdirectory.org. You agree and consent that Texas Certification Directory™ reserves the right at all times to disclose any information provided by you to Texas Certification Directory™ as Texas Certification Directory™ deems necessary to satisfy any applicable law, regulation, legal process or governmental request. You acknowledge and agree that Texas Certification Directory™ reserves the right to edit, refuse to post, or to remove any information or materials from its website relating to your voluntary participation in the Texas Certification Directory™ Small Business Certification program, in whole or in part, at the sole discretion of Texas Certification Directory™. Violation of the aforementioned Excessive Communication and Abuse Policy by a prospect, applicant, or voluntary participant in the Texas Certification Directory™ Business Certification program(s) will result in issuance of a "warning" or "advisory" to the prospect, applicant, or participant via email from Texas Certification Directory™. Continued excessive communication and abuse will result in the termination of this Contract by Texas Certification Directory™ in accordance with the its process policies, as set forth herein. Texas Certification Directory™ exercises due process in response to violations of this Agreement through Excessive Communication and Abuse. Texas Certification Directory™ will email a Report to the point-of-contact, outlining Your Company's violations of the Texas Certification Directory™ Excessive Communication and Abuse Policy. You will be given the opportunity to respond in a professionally written letter stating Your understanding of our Excessive Communication and Abuse Policy and why You violated the Excessive Communication and Abuse policy. Your explanatory letter must be sent via email to info@texascertificationdirectory.org within 5-days of the date the Report from Texas Certification Directory™ was sent. Upon receipt of your professionally written letter, Texas Certification Directory™ will attempt to address Your issues / concerns for a final time via email. During this period of disciplinary conduct, Texas Certification Directory™ reserves the right to suspend communication between You, Your agents and Texas Certification Directory™. Any second violation of the Texas Certification Directory™ Excessive Communication and Abuse policy will result in the termination of Your voluntary participation in the Texas Certification Directory™ Business Certification program. Such breaches of Contract causing termination of your voluntary participation in the Texas Certification Directory™ Small Business Certification program constitutes a forfeiture of your voluntary participation in the Small Business Certification program and affords you no right to refund or credit for lost fees. YOU EXPRESSLY UNDERSTAND AND AGREE THAT OWNER, OUR OFFICERS, EMPLOYEES, AGENTS, AFFILIATES, INDEPENDENT CONTRACTORS, SERVICE PROVIDERS, OR CONSULTANTS, OR ANY OF THEIR RESPECTIVE DIRECTORS, EMPLOYEES, AND AGENTS, WILL NOT BE LIABLE UNDER CONTRACT, TORT, STRICT LIABILITY, NEGLIGENCE, OR ANY OTHER LEGAL THEORY FOR ANY DIRECT, INDIRECT, INCIDENTAL, SPECIAL, PUNITIVE, COMPENSATORY, CONSEQUENTIAL, OR EXEMPLARY DAMAGES, EVEN IF Texas Certification Directory™ HAS BEEN ADVISED OF THE POSSIBILITY OF SUCH DAMAGES. In no event shall Texas Certification Directory™ its partners, affiliates, or advertisers be liable to You or any other person for any damages, including for loss of profit or goodwill, for any matter, whether such liability is asserted on any breach of this Contract or its incorporated agreements and policies for any loss in profits or revenues, a lack of financial benefit, or your inability to gain participatory access in any diversity or procurement program, even if Texas Certification Directory ™ has been advised of the possibility of such damages. Texas Certification Directory™ liability is limited to the total amount paid by You for this application to voluntarily participate in the Texas Certification Directory™ Small Business Certification program. Texas Certification Directory™ expressly disclaims all warranties and guarantees of any kind, whether express or implied, including, but not limited to, the implied warranties of merchantability, fitness for a particular purpose, non-infringement, or assurities that voluntary participation in the Texas Certification Directory™ Small Business Certification program will produce any monetary gain or participatory access in any diversity or procurement program. You agree to defend, indemnify and hold harmless Texas Certification Directory™ ("Texas Certification Agency, Inc.") and its contractors, agents, employees, officers, directors, shareholders, and affiliates from any loss, liability, damages or expense, including reasonable attorneys' fees, resulting from any third party claim, action, proceeding or demand related to the use or promotion of your voluntary participation in the Texas Certification Directory™ Small Business Certification program by you or your company or affiliates. In addition, You agree to indemnify and hold Texas Certification Directory™ harmless from any loss, liability, damages or expense, including reasonable attorneys' fees, arising out of any breach of any representation or warranty provided herein, any negligence or willful misconduct by You. This indemnification is in addition to any indemnification required of You as outlined elsewhere in this Agreement. In the event that Texas Certification Directory™ or any of its affiliates or partners, is notified of a pending law suit, receives notice of the filing of a law suit, or learns that Texas Certification Directory™ or any of its affiliates or partners is the subject or legal action or threatened legal action, Texas Certification Directory™ may seek a written confirmation from You concerning Your obligation to indemnify Texas Certification Directory™. Texas Certification Directory™ will send the "Indemnification Request" via email to your Company point-of-contact requesting this confirmation. The Indemnification Request email is deemed to have been received by You (through your Company's point-of-contact) within five (5) days of the date it was sent by Texas Certification Directory™. Written confirmation of indemnification must be received by Texas Certification Directory™ via email (at info@texascertificationdirectory.org) within ten (10) days after the Texas Certification Directory™ sent the Indemnification Request email to Your company's point-of-contact. The written confirmation must be signed by any person who completed a Texas Certification Directory™ sworn affidavit used in the employee and revenue standard(s) computation requirement for voluntary participation in the Texas Certification Directory™ Small Business Certification program. Failure to respond to the indemnification request or failure to provide this written confirmation will result in the suspension of Your Company's voluntary participation in the Texas Certification Directory™ Small Business Certification program. Suspension will be effective beginning the 11th day after the Indemnification Request email notification was sent by Texas Certification Directory™. Any suspended status shall remain in effect unless and until Texas Certification Directory™ receives written confirmation, signed by an appropriate person as outlined above. On the 365th day after the date this Application was electronically submitted (or your renewal payment was processed), Your voluntary participation in the Texas Certification Directory™ Small Business Certification program will be terminated. You agree that Texas Certification Directory™ shall have the right to participate in the defense of any such claim through counsel of its own choosing. You agree to notify Texas Certification Directory™ of any such claim promptly, in writing, through U.S. Postal Service Certified Mail at Texas Certification Agency, Inc., 100 Congress, Suite 2108, Austin, Texas, USA, 78701, and allow Texas Certification Directory™ to control the proceedings. You agree to cooperate fully with Texas Certification Directory™ during such proceedings. You understand and agree that Texas Certification Directory™ is located in the State of Texas for all legal and non-legal purposes. Therefore, this Agreement will be interpreted under and governed by the laws of the State of Texas without giving effect to any conflicts of laws principles. You agree that any claim or dispute that you may have against us arising out of or in relation to this Agreement will be exclusively resolved through arbitration. The failure of Texas Certification Directory™ to seek relief for your breach of any duty under this Agreement or otherwise will not waive the right of Texas Certification Directory™ to seek relief for any subsequent breach or claim. Any controversy or claim arising out of or relating to this Contract, or the breach thereof, shall be settled with binding arbitration administered by the American Arbitration Association (AAA) in accordance with its Commercial Arbitration Rules under the Claims Programs. You agree to waive all rights to a jury trial and All claims will be administered by "desk" arbitration, allowing only for the submission of documents. Judgment on the award rendered by the arbitrator(s) may be entered in any court with jurisdiction. You agree to pay Texas Certification Directory™ administrative fees in the amount of $150 per hour, in addition to legal expenses, upon initiation of a legal action against Texas Certification Directory™. You agree to pay Texas Certification Directory™ administrative fees in the amount of $150 per hour, in addition to legal expenses, for any legal action initiated by Texas Certification Directory™ against You, the cardholder on file stated on the electronic application submission, the owner's stated on this electronically submitted Agreement, and / or sworn affidavits used in the employee and revenue standard(s) computation for participation in a Texas Certification Directory™ Small Business Certification program. You agree that in the event you prevail in full on your arbitration claim that the arbitrator may but is not required to order a refund of any fees paid to Texas Certification Directory™ but in no event will Texas Certification Directory™ be required to pay any portion of the arbitration fees. YOU AND Texas Certification Directory™ AGREE THAT ARBITRATION WILL BE THE EXCLUSIVE FORUM AND REMEDY AT LAW FOR ANY DISPUTES ARISING OUT OF OR RELATING TO THIS AGREEMENT OR YOUR USE OR PROMOTION OF YOUR VOLUNTARY PARTICIPATION IN THE Texas Certification Directory™ SMALL BUSINESS CERTIFICATION PROGRAM; INCLUDING ANY DISPUTES CONCERNING THE VALIDITY, INTERPRETATION, VIOLATION, BREACH, OR TERMINATION OF THIS AGREEMENT, EXCEPT THAT OWNER RESERVES THE RIGHT TO ELECT AT ITS SOLE DISCRETION TO PURSUE ANY ACTION ARISING OUT OF COPYRIGHT AND/OR TRADEMARK INFRINGEMENT IN COURT INSTEAD OF THROUGH ARBITRATION. You agree that all notices (except for notices concerning breach of this Contract) from Texas Certification Directory™ to You may be posted on the Web site, www.texascertificationagency.com. Notices concerning breach of Contract will be sent to either the email address provided in this electronically submitted Application or to the point-of-contact's email address, as maintained on file with Texas Certification Directory™. In either case, delivery of all notices shall be deemed to have been made five (5) days after the date sent. Notices from You to Texas Certification Directory™ must be sent by email to info@texascertificationdirectory.org. The headings in this Contract are descriptive only and in the event of a conflict between a heading and the underlying terms of this Contract, the terms of this Contract shall control. You agree that this Agreement, including policies and agreements referenced herein, constitutes the complete and entire Agreement (Contract) between You and Texas Certification Directory™ regarding Your voluntary participation in the Texas Certification Directory™ Small Business Certification program. You understand and agree that there are no further understandings, agreements, or representations with respect to your relationship with Texas Certification Directory™ that are not specified in this Agreement. You understand and agree that any additional provisions that may appear in any communication from you will not bind us. You agree that the terms of this Contract are severable. If any part of this Contract is determined to be unenforceable or invalid, that part of the agreement will be interpreted in accordance with the applicable law as closely as possible, in line with the original intention of both parties to the Contract. The American Arbitration Association will interpret the contract in accordance with its Commercial Arbitration Rules under the Claims Programs. All claims will be administered by "desk" arbitration, allowing for submission of documents only, and judgment on the award rendered by the arbitrator(s) may be entered in any court with jurisdiction. The remaining terms and conditions of the Contract (not deemed unenforceable) will remain in full force and effect. The failure of Texas Certification Directory™ to enforce any of the provisions within this Contract or its incorporated agreements and policies against You or others shall not be construed as a waiver of the right of Texas Certification Directory™ thereafter to enforce such provisions. You understand and agree that no term or provision of this Agreement will be deemed to have been wiavved and no breach will be deemed to have been consented to unless such waiver or consent is in writing and signed by the party to be bound. Texas Certification Directory™ ("Texas Certification Agency, Inc., of Austin, Texas, United States of America"), will make every effort to keep the Web site, www.texascertificationdirectory.org and www.texascertificationagency.com operational. However, certain difficulties and other factors outside of its control, may from time to time, result in temporary service interruptions. You agree not to hold Texas Certification Directory™ liable for any of the consequences of such interruptions. Access to the Texas Certification Directory™ via the websites of Texas SBA, Inc., ("www.texassba.org") and Texas Small Business Association™ ("www.texassmallbusinessassociation.org") are provided at the sole discretion of the website owner(s). OWNER AND YOU BOTH AGREE THAT ANY CAUSE OF ACTION ARISING OUT OF OR RELATED TO THIS AGREEMENT MUST COMMENCE WITHIN ONE (1) YEAR AFTER THE CAUSE OF ACTION ACCRUES. FAILURE TO ASSERT A CAUSE OF ACTION WITHIN ONE (1) YEAR WILL PERMANENTLY BAR ANY AND ALL RELIEF. YOU WILL ONLY BE PERMITTED TO PURSUE CLAIMS AGAINST OWNER ON AN INDIVIDUAL BASIS, NOT AS A PLAINTIFF OR CLASS MEMBER IN ANY CLASS OR REPRESENTATIVE ACTION OR PROCEEDING AND YOU WILL ONLY BE PERMITTED TO SEEK RELIEF (INCLUDING MONETARY, INJUNCTIVE, AND DECLARATORY RELIEF) ON AN INDIVIDUAL BASIS. Sections 1, 2, 3, 4, 5, 6, 7, 8, 9, 10, 11, 12, 13, 14, 15, 16, 17, 18, 19, 20, and 21 shall survive any termination or cancellation of this Contract. Nothing in this Agreement/Contract, express or implied, is intended to confer upon any third party any rights, remedies, obligations, or liabilities under or by reason of this Contract, except as expressly provided in this Contract. Last Updated: May 11, 2015. Copyright 2010 - PRESENT. All Rights Reserved.